The Cuasmal culture inhabited the regions of Pasto and Carchi in what is now southern Colombia and northern Ecuador. This is a mountainous territory with an altitude of over 3000 meters, a temperate climate and abundant rainfall during the rainy season. Several rivers flow down from its high peaks. 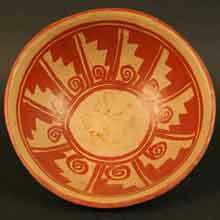 The Cuasmal economy was based on growing maize, for which they built terraces. They complemented this staple food by gathering other edible plants and hunting deer and rodents. Long distance trade allowed them to obtain exotic resources. Artistically, the Cuasmal culture is best known for its elaborately decorated ceramics, which display highly sophisticated graphic designs. 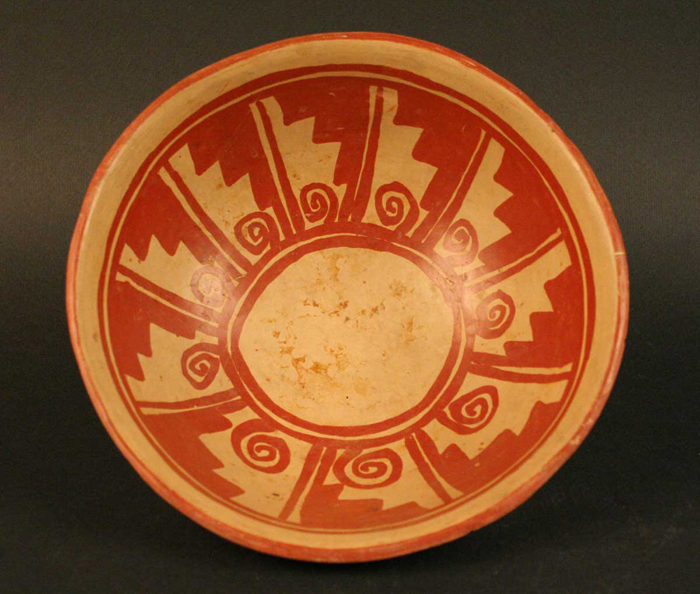 Using only a small palette of colors – mainly red or black on a cream background – they painted the same geometric elements that were commonly used by other groups in the region, but in new patterns. They also drew birds, animals, and humans in highly stylized forms, and sometimes represented a subject by drawing only certain parts. This elaborate decoration was applied to relatively simple ceramic vessels, mainly bowls with ring shaped bases and dishes. Differences in grave types, grave goods, and dwelling size suggest that Cuasmal society had different social ranks. The high level of development of their ceramics also suggests the existence of a class of craftspeople who specialized in that activity. Some cemeteries have been found close to Cuasmal settlements, although burials beneath their dwellings are also common, consisting of a cylindrical hole with a side chamber in which the body and grave goods were deposited. These excavations vary in size and in the quantity of grave goods they held. The smallest seem to have been used for children. The Cuasmal buried their dead in these graves after leaving them for some time in another location. Cuasmal settlements consisted of dense residential complexes built on mounds of compressed earth. These were situated on hillsides, relatively close to each other and separated by agricultural land. Dwellings had trapezoidal mud walls built on a circular floor plan and were fairly low, with a single doorway. Roofs were probably made of grass and held up with wooden beams. The Cuasmal culture arose from earlier groups inhabiting the area. The Cuasmal people maintained relations with other groups in the rainforest and coastal regions of what is now Ecuador and Colombia, and even as far afield as Costa Rica and Panama, as there was intense long distance trade throughout the region during this period. Contact with the Inka civilization around the year 1500 CE was reflected in ceramic motifs such as the eight-pointed star, as well as in Inka artifacts found in some local graves.